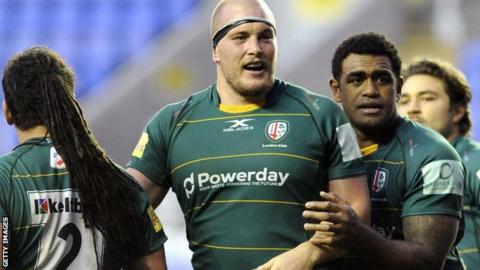 London Irish look the Championship's promotion favourites this season, but how long will the Premiership door remain open? It is English club rugby's debate that will not go away: whether to scrap or retain promotion and relegation between the Premiership and Championship. Speculation about a breakaway top flight with a ring-fenced competition has been the focus of intense discussion in recent months after Premiership Rugby sold a minority stake to private equity firm CVC Capital Partners. The £200m windfall, to be spread among 13 shareholder Premiership clubs, was said to 'herald' a new era for the nation's elite few. Shortly afterwards, Premiership head Ian Ritchie told the BBC it was "right and proper" to look into scrapping promotion and relegation. While not a definitive statement of intent, it does once again leave the RFU Championship - a competition where Premiership dreamers meet part-timers - uncertain of its future. In early 2017, following the liquidation of London Welsh, BBC Sport assessed the health of the much-maligned and often ignored Championship and where it might go next. Two years on, little has changed for the 12 clubs that make up the second tier. However, the threat of having the Premiership door shut on them is one many now take seriously and some are prepared to meet with a legal challenge. One chairman has told BBC Sport "no amount of money would convince him to scrap promotion", while another accuses the Premiership of "bullying" Championship clubs. Sports minister Mims Davies MP has also stated her intention to keep a close eye on the Premiership's intentions. Cornish Pirates are a Championship club committed to their Premiership dream, and they hope to have a new ground to show for it by 2020. With or without the long-awaited 10,000-seater Stadium for Cornwall, Pirates chairman Dicky Evans says promotion "should be mandatory for every league". He told BBC Sport: "Everybody should aspire to be at the top level - it's good for competition and it's good for life in general. "Other Championship clubs think differently though, they're not interested in promotion at all." Evans has stated that if ring-fencing was to be agreed by Premiership Rugby Limited members, he would take legal action with support from other Championship clubs. "I believe the deal with CVC has clauses in it that would allow ring-fencing to come in with enough members voting for it," he said. "My worry is that once London Irish get promoted, that's when they'll try it. "The RFU is in a quandary. They need the Premiership clubs' players for the World Cup squad later this year. They can't risk upsetting them or causing a potential players' strike." Nottingham chairman Alistair Bow echoes Evans' sentiments about Championship clubs having their aspirations frustrated if ring-fencing becomes a reality. "It takes away the opportunity to be the best professional rugby club we can be," Bow said. "At the moment, we're all playing in a competition where we know and understand the rules. In the Championship, we know what we're playing for and where we stand. "The Premiership is very different. It has criteria which, assuming you can meet it, you can play in. But, it's not a level playing field and it feels very secretive from the outside looking in." The Premiership Rugby Board is due to meet again in early February, while a number of Championship clubs held their own conference at Twickenham last week. Neither body has publicly stated its position about the future of promotion and relegation. However, Premiership chairman Ritchie highlighted to BBC Radio 5 live's Sportsweek this month where he feels ring-fencing already works. "The NFL is a classic example," he said. "But, these are complex matters and we've been discussing them for sometime. "We'll continue to discuss them. That's right and proper." Premiership Rugby and the RFU are four years into an eight-year deal, worth more than £255m and double the previous agreement, which allows the England national team greater flexibility and access to its players. The Championship are in the second season of a three-year unspecified "multi-million pound deal" which has seen automatic promotion replace the previous play-offs system. A club more than familiar of late with the contrasting fortunes in both competitions is Bristol. Promotions in 2016 and 2018 sandwiched relegation in the year in between. Twelve games into their latest top-flight campaign, Bristol are 10th and have a strong chance of securing consecutive seasons in the Premiership for the first time in 10 years. Owner Steve Lansdown would like to see the Premiership ring-fenced for a three-year period. He also proposes a play-off at the end of those three years between the bottom Premiership team and the Championship winners, but admits the RFU may need more persuading about its benefits. "They would be silly not to recognise that the opportunity is there to do this," he told BBC Points West. One man who has seen and done just about as much as anyone in club and international rugby union is Sir Ian McGeechan. Now, as executive chairman of Yorkshire Carnegie, the former Scotland captain and four-times British & Irish Lions coach believes Championship clubs should be encouraged to try to emulate Exeter Chiefs as a club that rose from the lower reaches of English rugby to establish themselves as a Premiership force. "I'm not averse to ring-fencing," he told BBC Radio Cornwall. "As long as it doesn't cut out teams that genuinely have the capability of being there (the Premiership). "With playing and competition structures and everything else, it needs to have a clear and open mind as to how rugby is taken forward in the next five to 10 years. "Any good organisation keeps reviewing where it is and makes the necessary changes as and when. If you're doing coaching, that's what you're doing every week with players and teams." What do players and coaches past and present think? For three decades, the merits of promotion and relegation between a professional league and a second-tier that has never quite caught up with the times has been debated. And it is not a conversation that has been limited to the boardroom, with players - both current and former - having strong views of their own. Former England and British & Irish Lions scrum-half Matt Dawson says it would be "better for the game". Speaking on his BBC Radio 5 live rugby show, he said: "It would be better for the younger players, younger English players. "For the welfare of players, it would extend their careers. I think they will play fewer games. Overall, we will have a better national side. "At the moment, players are not played because of the risk of relegation. "You get to the end of the season and if Leicester, Worcester, Northampton, Sale and Newcastle are in that position, you can't tell me that they will blood a young scrum-half in a game that could potentially put them down." Former Saracens back row Will Fraser, however, doesn't agree. "If we want to keep generating young English players, we need to have the Championship as a league as a method and progression pathway for young players to use to come through to the Premiership." Saracens and England full-back Alex Goode added: "The key for me is that there is competition in every game and fans genuinely enjoy that. "We've seen in rugby league with the end-of-season split that came in with the Super 8s, it just gets lost. "You don't know who is playing who and for what, it's too long and you are adding more games to the season." Harlequins and England scrum-half Danny Care said Exeter's success defines the value of promotion at the top of the English game. "If you ring-fence, you lose the dream. You lose Exeter Chiefs' dream," said Care on BBC Radio 5 live's Rugby Union Weekly podcast. "That is what I grew up with watching football and rugby, teams go up and teams go down. "It's great to see a team from a lower division come up to show what they have done, none more so than Exeter." He added: "When down near the bottom, I can understand why teams and players wouldn't be happy with it and would be happy to see it ring-fenced, but then I just think you would lose part of the competition. "Would all teams be fighting for the trophy? I don't think so. Would all teams be that bothered about winning every game, doing all they could to get a bonus point away from home? "It would be a bit worthless. I like the fact that there is promotion and relegation. It means that every point is worth fighting for and you have the dream of coming up and doing something special." From the Championship, Jersey forwards coach Neil Tunnah told BBC Radio Jersey that he "would hate to see ring-fencing come in". He said: "There's a huge amount of value in playing games that have meaning at the back end of the season, whether that's to win a championship or avoid relegation. "I certainly believe it puts bums on seats and gets people in the gates as well. "If you ask players, which is the most important thing, they want to be playing for things every single game, whether that's top end of the Premiership or bottom end of the Premiership, or top end of the Championship. "If you take that away, you take something pretty special away from the game." Cornish Pirates joint head coach Gavin Cattle summed it neatly when he said "people are going to look after their own interests". Talking to BBC Radio Cornwall, he added: "From our point of view, we want to aspire in the future. "We might be a few seasons away from it, but it's something we dream of and we want to achieve. "The Premiership will want to look after their own concerns, there's a lot of money involved nowadays. My opinion is to keep that dream alive." Additional reporting by Andrew Aloia and Brent Pilnick. What next for rugby's Championship? Read more on RFU Championship: What next for English rugby's troubled second tier?